Hagemeister Park was the first home of the Green Bay Packers and also the preferred gathering spot for the people of Green Bay early in the 20th Century. It was where they convened for ballgames, picnics, festivals, circuses, fairs and just about every other kind of social or sporting event. Hagemeister included all the land north of Walnut Street and east of Baird to the East River, including where East High School and City Stadium now stand, and also all of what is now Joannes Park. Formerly owned by the Brown County Fair and Park Association and called Washington Park, the area became known as Hagemeister Park in 1899. That was when the Hagemeister Brewing Co. purchased the northern section and Joannes Bros., a wholesale grocery firm, bought the southern part. Henry F. Hagemeister was put in charge of the entire grounds and presumably that was at least partly why it was commonly called Hagemeister Park, although the southern part was sometimes referred to as the Joannes addition or portion. At that time, Walnut ended at Baird and there was no street that divided the two properties. 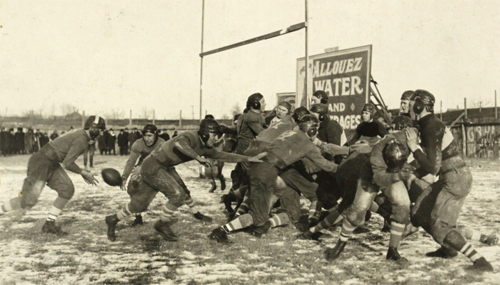 The Packers played at Hagemeister from 1919, when they were organized as a semipro team, through 1922, their second season in what became the National Football League. The Packers crushed the Menominee North End Athletic Club, 53-0, in their first game there on Sept. 14, 1919; and they edged the Minneapolis Marines, 7-6, in their first NFL game there on Oct. 23, 1921. The Packers played on a sandlot field with no fence or stands in 1919 and then in a small, wooden ballpark with less than 5,000 seats over the next three seasons. Hagemeister also was home to Green Bay's first minor league baseball team from 1905 through 1914 and was the site of the first 17 games in the storied Green Bay East-Green Bay West football rivalry. The park also included a large oval track for horse and harness races, a shaded picnic grove, a clubhouse with a dance hall and bowling alley, a roller rink and a pavilion first used as a theater and later as an armory. In 1919, the Joannes family donated its 38 acres to the City of Green Bay for official park use. Four years later, construction began on East High School and the Hagemeister Park name soon disappeared until it was resurrected in 2012 as a locally owned, theme restaurant and modern-day gathering place for sports fans and social events of all kinds.